Officials told the Yedioth Ahronoth daily that the weapon, apparently a Strela shoulder-launched surface-to-air missile, targeted an Israeli military helicopter over the Hamas-ruled territory last week but missed. The threat posed by such missiles—also known as "man-portable air defense systems" (MANPADS)—has been cited for years by Israeli security officials in expressing concerns about the risks of Palestinian militants using them against passenger aircraft approaching and leaving Israel’s main international airport. Ben Gurion Airport near Tel Aviv is located less than five miles from the nearest territory the Palestinians want included in a future state. In September last year White House counter-terrorism advisor John Brennan told reporters that administration was concerned that Libyan regime weapons including MANPADS could get into the hands of al-Qaeda and other terrorist groups. It was reported at the time that thousands of shoulder-launched anti-aircraft missiles were unaccounted for in Libya, having gone missing from a looted regime arms depot. MANPADS’ ease of operation, portability and relatively low cost make them a weapon of choice for terrorists wanting to target civilian or military aircraft. The reported use of MANPADS by Gaza-based terrorists came during the same week that Hezbollah, the Shi’ite Iranian proxy in Lebanon, deployed a drone aircraft over Israel. 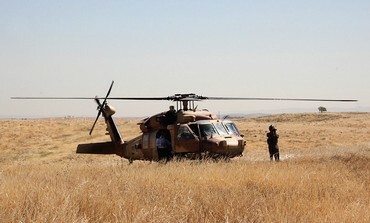 The unmanned plane was shot down over an uninhabited area in southern Israel, and Hezbollah leader Hassan Nasrallah in a speech said it had been designed in Iran and assembled by his group in Lebanon.